It is always a pleasure to read one of J. A. Jance’s books. This one does not disappoint. J. P. Beaumont is bored with retirement. Mel solves this problem by agreeing to foster a dog in a domestic abuse situation that included an officer-involved shooting. Dinner in Seattle Maxwell Cole re-enters Beaumont’s life. Later that night, Maxwell died in a house fire. The story takes several twists and turns as Beau learns about dogs and he is trying determined if Maxwell’s death was an accident or murder. Beau has no standing in the matter so he must use his wits to learn any information. Will he succeed? How does Rambo/Lucy change Beau’s life? I highly recommend this book and series. This entry was posted in Books, Uncategorized and tagged Beau, Favorite, J A Jance, Maxwell Cole, mystery, PI, Thriller. Bookmark the permalink. It could work as a stand-alone. 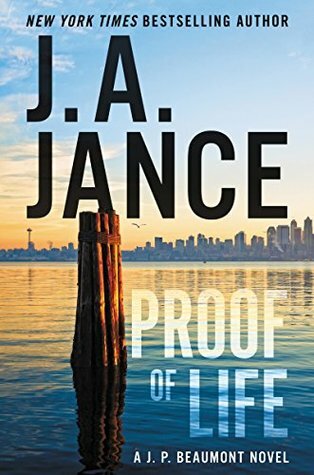 Jance usually doesn’t have single books. She has 4 series. My mom used to love her books. You must be caught up with your ARC’s. I notice you reading a lot of books that must be from your TBR simply for you list. Fun! Yes, I am reading my February ARC’s now. I have some books I want to read from my library and I have couple from the authors to read. I had no ARC’s for This week so used my Library books and FALLOUT is on special. Most libraries probably have Sara Paretsky’s books.